Introduction: Lymph node-positive biliary tract cancers are consistently associated with poor overall survival and optimal management remains controversial. Systemic chemotherapy along with adequate surgical resection is the mainstay of treatment. We sought to evaluate whether a "Surgery-First"? approach provides the best outcomes for this group of patients. Methods: An augmented version of the Surveillance, Epidemiology, and End Results program database was utilized to identify patients with lymph node-positive biliary tract cancers without distant metastases from 2000 to 2014. Patients were stratified by disease subgroup (gallbladder, intrahepatic, extrahepatic, or hilar) and treatment received (surgery alone, chemotherapy alone, or surgery+chemotherapy). Survival was analyzed using Kaplan-Meier and Cox proportional hazard modeling. Results: A total of 3,226 patients with node-positive biliary tract cancers were identified. Females made up 57% of the cohort and over half of the patients were aged over 70. For patients who underwent a "Surgery-First"? approach, 1,386 (43%) received surgery alone with no systemic therapy while 1,451 (45%) received surgery+chemotherapy. Three hundred and eighty-nine (12%) patients received chemotherapy alone. Median overall survival was longer in patients who received surgery+chemotherapy (19 months, p<0.05), while there was no difference in survival for those who received surgery alone ("Surgery-First"?) versus chemotherapy alone (10 months for both, p=NS). Receipt of systemic chemotherapy in addition to surgery was independently associated with survival on Cox proportional hazard ratio modeling compared to surgery alone (HR for mortality 1.71, 95% CI 1.56-1.87, p <0.0001) or chemotherapy alone (HR 1.68, 95% CI 1.46-1.92, p<0.0001). Conclusions: A "Surgery-First"? approach for patients with lymph node-positive biliary tract cancers leads to significant undertreatment and sub-optimal survival outcomes. Forty-nine percent of patients who receive surgery prior to chemotherapy never receive systemic therapy, and surgery alone provides no survival benefit over palliative chemotherapy. Up front chemotherapy should be strongly considered for patients with suspected or proven lymph node-positive disease. 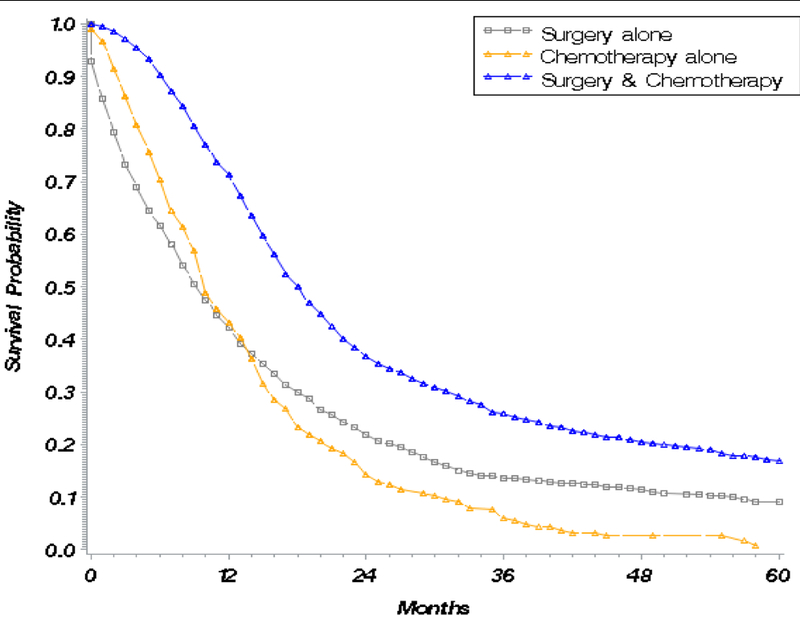 Kaplan-Meier curves for overall survival in patients with biliary tract cancers receiving surgery alone, chemotherapy alone, or surgery+chemotherapy.